If you are looking for brilliant yellow flowers late in the season, then Helianthus x multiflorus is well worth considering. This a variety of the perennial sunflower, the flowers may not be huge, however they make up for that in quantity. With masses bright golden yellow flowers on tall stems, Helianthus x multiflorus is a standout in the garden from late summer through to autumn. Tall growing to 3 metres, it adds height to the garden border. The flowers of this perennial sunflower will either be single or doubles, depending on variety. 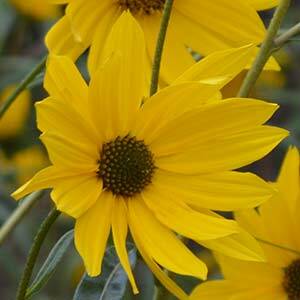 This is a perennial sunflower and will provide an easy care plant for many years. 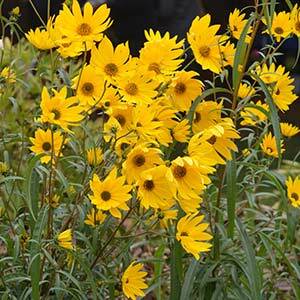 The perennial sunflowers does require a warm sunny position, and also a well drained soil. Good air flow will help prevent disease. Plants can be staked as required to maintain good upright growth, plant hoops are another option. The taller varieties are excellent when planted at the rear of the garden border, or as a feature in the mid border. Perennial Sunflowers also make great cut flowers. Grow them in a container in a sunny position in a courtyard where they will add color and height. Position – Full sun. Soil – Humus rich well drained with some moisture. Propagation – Easy by division. Helianthus x multiflorus is available for sale from the following nurseries.